I work in the field of sustainable transportation, so I’ve known since January the date of this year’s Bike-to-Work Day (June 25.) June is my busiest month at work, since it is Walk & Bike Month here in Boulder. Wait? Isn’t June Pride Month? When someone asked me if I were going to Denver Pride, my response was, “Oh. When is that?” This isn’t the first year that’s happened. When did my Gay Pride Month turn into my Walk & Bike Month? Why was I last at Denver Pride during the Bush years? The George Herbert Bush years. While it took me to until age 24 to figure out I was a lesbian, once I came out, I did it with a political bang. 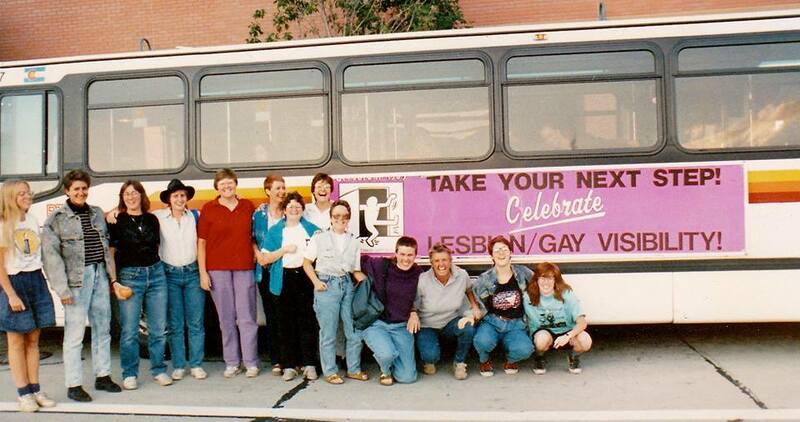 In the mid-80s and 90s, helped organize monthly events with Boulder’s Lesbian Connection. I helped write and publish its monthly newsletter. My friends and I organized lesbian New Year’s Eve dances. I wrote queer humor columns for the Denver gay papers. I wrote and published lesbian humor books and jetted off to gay conferences and lesbian bookstore to talk about them. This isn’t bragging. This is puzzlement. I once helped raise money to put a huge pink “Coming Out Day” ad on the side of the bus. Now, I answer questions about bus routes and Eco Passes. So long as you don’t feel alone and unwanted. I’m not sure there’s any other reason for getting together with other people.